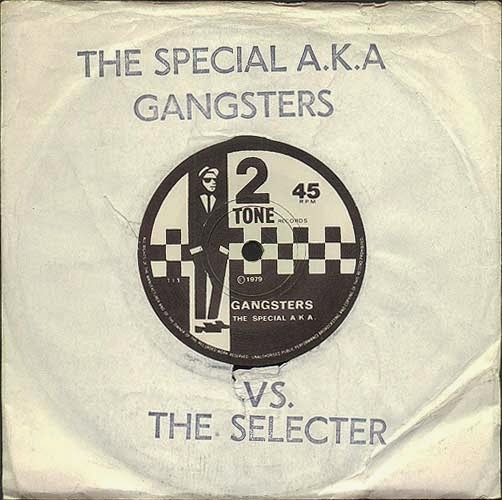 We owe a giant tip of the hat to Marco on the Bass for flagging today as the 35th anniversary of the release of “Gangsters,” the first single by two-tone era ska band The Specials. I’d always known it to be influential track, but it was only recently that I learned some of the history behind the single’s release. I had heard it in high school back and I first owned it as it appeared on the CD release of the bands’ debut self-titled record though it did not appear on the original LP release. Earlier this year I finished reading autobiographies by both Pauline Black of The Selecter and Horace Panter of The Specials. In addition to giving deep insight into their personal lives and the development of their bands (I’ll spare you the full on book reviews right now), they both discuss the release of the record in detail and its impact on the band. Needing a b-side the band turned to an instrumental track Noel Davis had recorded two years previously in 1977 with drummer John Bradbury and trombonist, Barry Jones. Originally titled ‘The Kingston Affair’ the track got a slight reworking and was re-titled The Selecter. The track also came complete with it’s own unique catalogue number, which may seem unusual but was actually quite common with old ska and reggae singles. I’ll never forget how eerie the song was in stark contrast to the peppy 3rd wave ska/punk I was first introduced to. It was certainly an important step in my own awareness and appreciation for the wider range of ska music in the world. Happy Birthday, Gangsters. You don’t sound a day over 25.